"The new Student Movement in South Africa: From #RhodesMustFall to #FeesMustFall"
Uthando Lwethu: Why did we do this study? The Human Sciences Research Council (HSRC), South Africa's statutory research agency, conducts research that generates critical and independent knowledge relative to all aspects of human and social development. The HSRC provides access to Research Outputs created by HSRC researchers since 2000. Channels of interaction in health biotechnology networks in South Africa: who benefits and how? The HSRC conducts large-scale, policy-relevant, social-scientific projects for public-sector users, non-governmental organisations and international development agencies. 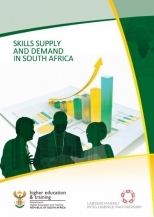 The Human Sciences Research Council (HSRC) was commissioned by Department of Higher Education and Training (DHET) to study the dynamics of skills supply and demand in order to inform skills policy in South Africa. The South African labour force is made up of 15 million employed and 7.5 million unemployed people. Three quarters of the employed and 90% of the unemployed are from the African population group. Unemployment is also particularly high amongst youth (15 to 34 years) and this is increasing as more young people join the labour force. The education level and skill base of the labour force is lower than that of many other productive economies. Of the employed population, 20% has a tertiary qualification, 32% has completed secondary education, and close to half of the workforce do not have a grade 12 certificate. Sixty percent of the unemployed has less than a grade 12 certificate. This translates to 11.75 million of the labour force with less than a grade 12 certificate. Read more about the key findings and download the report here. Please type security code displayed on the image to proof that you are human. © 2019 The Human Sciences Research Council (HSRC). All rights reserved.